It’s been one year since the World Health Organization (WHO) declared Zika a public health emergency. 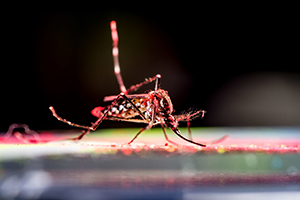 The virus, transmitted through the Aedes aegypti mosquito, has since been declared to be a long-term problem rather than an emergency, but Zika continues to concern health professionals. At the Eck Institute for Global Health at the University of Notre Dame – a global leader in the study of Aedes aegypti – the vector-borne illness is one researchers hope to better understand. Are we in a better place today? Has Zika stopped spreading? Nicole Achee – research associate professor, specializing in medical entomology and global health: Certainly, the WHO declaration of Zika as a public health emergency of international concern drove a near immediate global response to coordinate efforts to control the spread of the virus, as well as greater awareness from the public. Global human movement, vulnerability and exposure to mosquito vectors all influence the spread of Zika virus — these components for an outbreak have not changed. However, should an outbreak occur in the future, the ability to respond may be facilitated by new control strategies being developed due to changes in funding for research including a potential Zika vaccine. Alex Perkins – Eck Family assistant professor specializing in infectious disease epidemiology and population biology: Despite the fact that Zika is no longer a hot news item and the epidemic has subsided in many areas, it still persists as a major concern for global health. In some ways, the situation is worse than it was a year ago, because we are now aware of recent Zika transmission in Asia and its great potential for transmission there. New findings about the many disease manifestations associated with Zika virus infection and the percentages of infected people that suffer some form of serious complication has only grown as we’ve learned more about the virus. John Grieco – research associate professor and associate director of the Eck Institute for Global Health, specializing in ecology of vector-borne diseases: In many developing countries where Zika is of greatest concern, the lack of resources limit the extent to which we can control the spread of disease. The situation is further complicated by the loss of some of our most effective vector control tools due to insecticide resistance. Despite numerous hurdles, public health officials continue to battle the spread of Zika as well as other vector-borne diseases. While Zika is at the forefront of our current discussions, we must not lose sight of other diseases transmitted by the same Aedes aegypti vector such as dengue, yellow fever and chikungunya. What do we still need to learn about Aedes aegypti and Zika? Alex Perkins: It’s important to understand the infection process in the mosquito, including the incubation period of the virus in the mosquito — and what the chances are that a mosquito infected a number of days ago will infect a person that it bites. The change in designation from public health emergency to long-term problem can lead to a reduction in funding for research. It’s important to keep the emphasis on research of vector-borne diseases using Zika and other viruses as an indication that these won’t be the last to come into the United States and we need to be ready for them when they do show up. Nicole Achee: Perhaps the most pressing question is the range of mosquito species that are competent for virus replication and able to transmit the virus. Answering this will help us to identify best approaches to control these mosquito vectors of importance and thereby target resources in endemic countries effectively. Other questions include whether there is an evolved relation between virus strain virulence and mosquito host physiology. We have much to learn but progress is being made. Where do you see the research in this field going? What does the future hold? Nicole Achee: The future of cutting-edge science is focused on manipulating the mosquito physiology to prevent the virus from replicating, as well as implementing innovative strategies for preventing adult mosquitoes from biting humans in areas where virus transmission is occurring — gene technology is one part of these discussions. Alex Perkins: Developing accurate diagnostics capable of detecting past Zika infections remains a high priority — and is one of the greatest impediments to putting the pieces together of what exactly unfolded over the last year or more. Improved understanding of the dynamics of Zika virus infection within humans is also extremely important, because it would improve our understanding of the causal mechanisms of severe disease outcomes associated with Zika virus infection and would also give us a better idea of the significance of sexual transmission of the virus. John Grieco: While Zika will remain a public health concern for the foreseeable future, I think that it serves as a wake-up call for how easily new pathogens can be spread around the world. In a rapidly changing environment we must develop the capacity to recognize the emergence of new threats, communicate these findings to the proper health authorities and develop the proper control measures. The establishment of such disease surveillance networks is costly and will require a major financial commitment from governments and donor agencies. The University of Notre Dame, through its Department of Biological Sciences and Eck Institute for Global Health, have a long and rich history of research and training in the fields of tropical infectious diseases and their arthropod vectors since the establishment of the Vector Biology Laboratory in 1957. Since then, Notre Dame researchers have pioneered state-of-the-art genomics research, leading initiatives to sequence two of the most medically important disease vectors, Anopheles gambiae and Aedes aegypti. Originally published by Jessica Sieff at news.nd.edu on February 01, 2017.